Anyone who got up this morning and tuned into this story on Radio New Zealand’s Morning Report can be forgiven for thinking that they woke up in Opposite Land. In the same week that Bolivia passed a law to protect its native freshwater dolphins from fishing and pollution, New Zealand voted against a resolution to protect our Maui’s dolphins from fishing impacts at the world’s largest conservation meeting. New Zealand, the country that promotes itself as 100% Pure to the world, was one of only two countries to vote AGAINST crucial protection for our Maui’s dolphin in an IUCN World Conservation Congress in South Korea. The majority (117) of countries voted for New Zealand to ban gill netting and increase observer coverage where the dolphins are found. According to the RNZ report, the anonymous vote was revealed only after a Department of Conservation staff member told the congress that the Ministry for Primary Industries had instructed it to vote that way. However, a statement put out by the department later said that didn’t occur – something’s fishy here (or should that be “mammal-y”?). According to the New Zealand Government (whether it’s the Ministry for Primary Industries or DOC), we didn’t support the recommendation from the world’s largest conservation meeting because there wasn’t enough evidence. But a summary of responses from marine mammal scientists on the excellent Science Media Centre site this year shows that fishing-related mortality is a real risk and must be addressed. For example, Liz Slooten, one of New Zealand’s leading dolphin experts, said the Hector’s and Maui dolphin Threat Management Plan, which was compiled (over a period of years and after extensive consultation with fishing industry, conservation groups, scientists iwi and others) between DOC and the then-Ministry of Fisheries listed fisheries mortality as the No 1 threat. Another scientist, Wayne Linklater, said that in purely economic terms not protecting the dolphin was risky because of the impact on the food chain of removing the dolphins from it. He said the loss of fish predators like dolphin can actually reduce ocean productivity for fisheries in the long term. Regardless of the minutiae about the evidence required to protect Maui’s dolphins, it’s time to stop “buggerising around”. There are 55 adult Maui’s dolphins left on the planet – we must act now. Our international reputation has been reported to be “tarnished” as a result of the bad look by being one of only two countries to vote down a resolution intended to protect the world’s rarest marine mammals. I think perhaps we should hand the mantle of “100% Pure” to Bolivia, because I’m not sure we deserve it anymore. Do you? 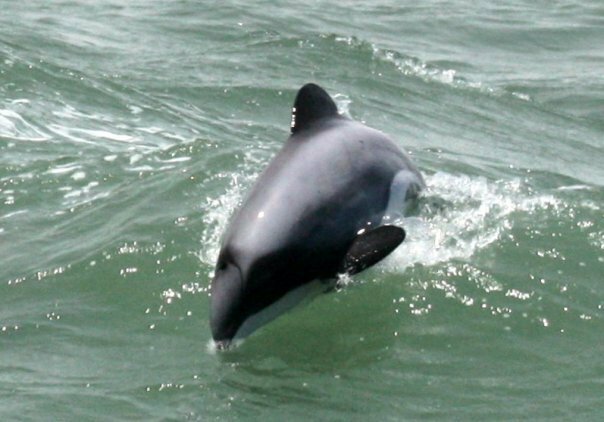 And if you’re not sure what a Maui’s dolphin looks like, this fisherman got footage of one a couple of years ago near Taranaki on his cellphone.